Despite having recently unveiled a hand-hammered US$6000 timepiece, Casio G-Shock is best known for its no-nonsense, black plastic watches that are almost indestructible. 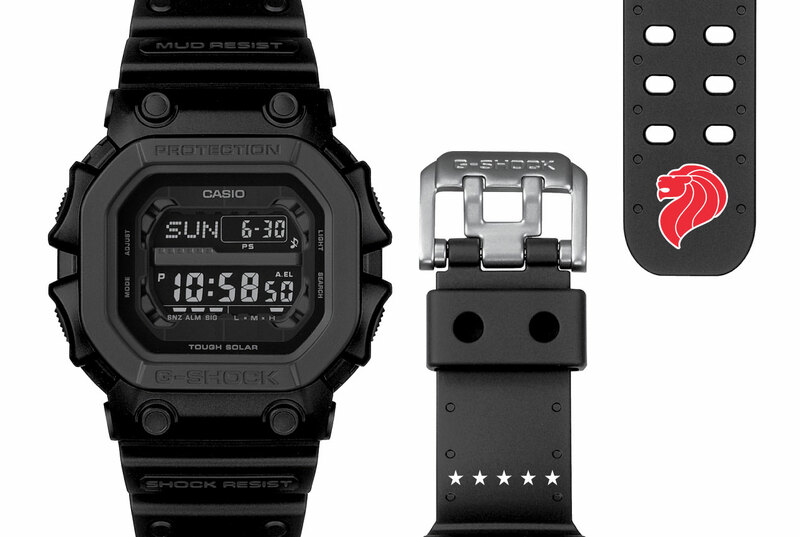 The G-Shock Singapore edition sticks to that tradition, with an matte black resin case and strap. Named after Singapore’s national anthem, Majulah Singapura, the Singapore edition is based on the “Black Out Basic” model GX-56BB-1. The Singapore elements are found on the strap, with the nation’s emblem, a red lion’s head, on one side, while the other half of the strap has five white stars. That’s a reference to the five stars on the Singapore flag that represent democracy, equality, justice, peace and progress. Being on the strap, these elements are less overt, allowing the watch to retain its “tool watch” look. Solar-powered, the watch will run 11-months on a full charge with normal use. It includes all the typical functions of a G-Shock, including stopwatch, countdown, perpetual calendar and world time. The Casio “G-Shock x The Majulah” is available from G-Factory stores in Singapore starting August 2016, priced at S$229 including tax.